The Roush Performance Resonator Delete X-Pipe is a great way to eliminate your factory resonator to get amazing race-inspired sound ans eliminate some restriction from your factory exhaust. 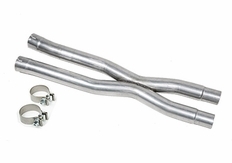 The Roush X-Pipe increases flow through your Mustang GT exhaust system for maximum horsepower and torque. The 2.5-inch X-Pipe assembly is made from high-grade mandrel-bent stainless steel to ensure maximum flow and less back pressure, along with long-lasting durability. 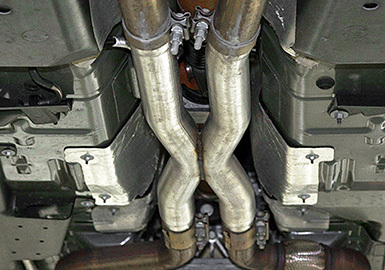 The system is designed and engineered using OEM vehicle CAD data to ensure perfect fit. The 12-pound weight reduction over stock muffler assembly is icing on the cake. The part number for this item is Roush 422046 and it fits 2015-2018 Ford Mustang GT (5.0 Coyote V8 Models).